The main ides of this project was to keep it as simple as possible, however the whole development process took lots of time - I have started this adventure in February, 2014. Of course, I couldn't dedicate all my time to this device, as I have lots of work to do with my RM-5 Ribbon Microphone manufacturing business, but still, a year is quite a lot. Have to note, that most of the time was actually spent working on the output transformer design - prototype hand-winding (believe me, you really don't want to hand-wind over 1000 turns on a toroid core! ), testing, re-winding, re-testing and so on until the best balance was found. 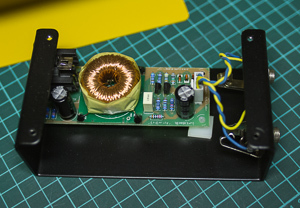 I think we all can agree on the fact that an output transformer is the most critical component of such design, so this time investment does really make sense. So, few words about the actual design now. I was sure that I want a j-fet in the input stage from the very beginning, as one of the main benefits the active DI can provide is a very high input impedance, which can contribute a lot to passive pickups, be it guitar or bass. I have set the input impedance value at 10Mohms. The j-fet is a good-old 2SK246, which does not offer high gain (we barely need any anyway, as DI actually attenuates the signal), but offers good headroom for such type of device. In this particular circuit the j-fet is biased to have the input signal headroom of approximately 1.2Vrms. No negative feedback is applied. The downside of such approach is the necessity to sort the j-fets by their Idss ("idle current"), group them, and to pair with different source resistor (Rs) values for each range. Not too good for serial production, but perfect for DIY, so every builder could benefit from the great sounding simplicity. The kits will come with j-fet/Rs pairs properly picked. The next stage is a simple bipolar transistor emitter follower. The first idea was to use the j-fet only and to couple it directly to the transformer, but due to the high output impedance of the stage (around 1.5Kohms) the lowest end performance would be compromised this way or the output transformer would have to have the primary winding inductance value (read - turn count and core size) that wouldn't be practical in both - size and costs. So, the simpler way was to add a low impedance buffer to drive the transformer properly, plus it is actually very convenient to direct-couple the emitter follower to the j-fet stage, so there is no need for an interstage capacitor here. Finally, the output stage is the output transformer, which is separated from the driving stage by an interstage capacitor. The transformer has a good long line drive capability due to the presence of a Faraday shield. The biggest natural advantage of the toridal design is the huge immunity to EMI, so the trafo does not need canning, it does not hum even when PCB is out of the enclosure (unless you put it right next to a laptop). The first tests have shown that I haven't spent the time designing the trafo in vain - this little beast does really sound good and the whole kit with the trafo and enclosure included should be available at the price similar to the price of a single Lundahl output transformer! I used my BB ADI at church last Sunday (I play a MIM P-bass) and WOW! We have been using a cheap passive DI and there wasn't any definition to the bass, just low end rumble, I plugged this in and all of the issues with the bass tone through the system were gone, every note rang out clean and clear ... I just ordered a second one!!! I just built and tested my 2nd one of these. I've tried this on a passive electric bass, an upright bass with a nice pickup, and a keyboard (S90XS). It's generally advised to use a Passive DI with a modern keyboard... but after I tested this Bumblebee Active DI on the mono out of my keyboard... and then A/B'd against the Direct In on my Apogee Ensemble I was thoroughly impressed and immediately ordered another matching unit. I matched the level for both recordings... but the Bumblebee Active DI just gave me more Low-End content and more High-End content than the Apogee Ensemble. The apogee sounded fine... but just very straight and clean... Through the Bumblebee Active DI it just comes alive and sounds amazing. This is not the easiest kit to build due to have to verify which resistor is which by testing with a multimeter ...not easy for a drummer : ) ...and by verifying color bands on the resistors, etc. But overall, it's a great design and build. I bought one... tested it... and loved it so much that I bought another... that's the real review. I highly recommend it.... You won't regret it.